There's a part of me that wishes we'll get the Japanese version with all its extra content, localized for us English speakers (and my European brothers and sistahs). It's probably just going to be the US version, but I can dream, can't I? Feel free to ask questions if you want to know what I'm talking about, by the way. Almost exactly 10 years isn't bad for a digital release at all. Golden S Mark (Other version + Crossover Battle 2 rewards), Gate Mark (Beast Link Gate usage for installing Link Navis for your version and defeating ForteSP with each), and the Blues Mark (Card e-Reader+ Event Mission Cards for defeating BluesFZ) are the things missing that were meant to be additional, excluding the 3 Event Battle Chips. You, yeah you...... 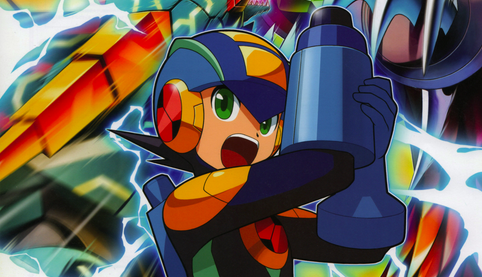 I asked you about the Rockman & Forte's manual before but you didn't bother to reply. Wait, me? Sorry that happened, but I'm afraid I know nothing at all about that game's manual. The BN and SF games are my only Rockman forte's. Nah.... not you Jexulus, but Nigoli. I need confirmation about some part of the manual if it was legit, that's all. I apologize. I wasn't trying to ignore, I just never came back to that post to see the comments. Also just busy with IRL stuff lately. Unfortunately I don't own R&F WS myself. Ah okay, I thought since you collected so many Rockman stuff, chances are.... you might have the R&F WS too. Unfortunately. Happy to see the complete .EXE/Battle Network series outside network transmission unfortuately, make it to Virtual Console, I hope we'll get to see the Star Force and ZX games make it to VC in the future. Gonna be real here: unless you are a fan of both Classic and BN, Network Transmission is not really worth playing. I personally enjoy it, but its backwards difficulty curve can be hard to overcome if you aren't motivated. Though, it seems like you've already played it anyway.